So I thought I’d have a browse on the guide to see what’s on and all of a sudden it’s giving a preview of the program I happen to land on. This is really off putting but I can’t see anything in settings to stop it doing this and going back to normal. Does anyone know how to turn this feature off? I’m guessing there was an upgrade overnight as it wasn’t showing this yesterday. Thank you for replying. I wish things like this weren’t forced on us. Nevermind! Received new You View box yesterday (great improvement on old one) but dismayed at Guide changes - now cannot read it from my armchair and have to stand close to the TV to read it. Will have to go back to The Radio Times! Get the YouView app (or BT or TalkTalk app if you are with one of them) on an Apple or Android tablet or smartphone, if you have one, and pair it with your YouView box. Then not only can you see the Guide - same Guide as your box has, after they have synchronised - close up, you can even choose programmes to record, and the recording request will be sent to your box. Might save you £3 a week! NOTE: edited as per @Skiller’s observations below, and further investigations on my part. you can even choose to add programmes to record, or (if supported by your model of YouView box) to your Watchlist, so you are reminded when they come up. Unless your "Watchlist" (one word) has a particularly different meaning to YouView's "Watch List" (two words), I fail to see why you introduce this into your recommendations for the YouView app. Incidentally, I tried to book a Reminder from the TalkTalk app a few times recently (just to test it, as I have never had the need to use a Reminder) and although the app said it had been sent to the box, I had neither a Reminder icon on the programme in the EPG, nor an actual Reminder. Can you confirm that it actually works with your app and if so, which app? Well, I meant the same Watch List. But as per my recent long post about its shortcomings, actually trying to use it, rather than just to test it, reveals design shortcomings that probably(?) aren’t software bugs. But I see, on checking, that I have been guilty of assuming that things would work as I think they should, and/or perhaps not thinking through what ‘should’ ought to be. 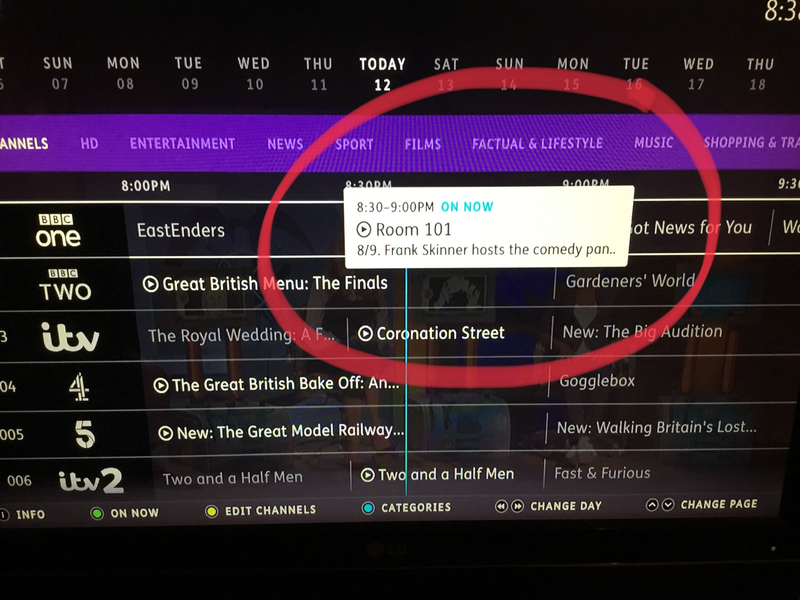 A reminder set on the YouView app seems to stay as a reminder on the YouView app, and the app doesn’t seem to even attempt to pass it to the box it is paired with. Thinking deeper, though, I can see why this might be the design behaviour; no doubt @Stephen can enlighten us here. I can’t speak for the TalkTalk app, though, as I am not a TalkTalk subscriber, and now, like the BT app, it seems to need the ISP login. I have edited my post above accordingly. Thanks for the heads-up. I said in my previous message that the app said that my Reminder requests had been "sent to the box". I was mistaken; it said that the Reminder has been "set". Now I come to think about it, I seem to remember some discussion about this feature when it was introduced and understanding the reasoning why a Reminder set within the app would only trigger a Reminder notification on that mobile device rather than on the box itself, although I'm not 100% convinced I agree that's the best way for it to function. Also, I think my test Reminders weren't producing any actual Reminders whatsoever is down to my not giving it enough notice. Lastly, are you sure about the TalkTalk YouView TV Planner app now requiring a TalkTalk login for it to function? I can still use mine without a login, but if what you say is true, I wonder if, should I have the cause to remove and reinstall the app, it would then insist on a login from now on? I have now deleted that and loaded the TalkTalk TV Planner app, which nobody sensible could possibly confuse with the radically differently named TalkTalk TV app, and it does indeed not insist on you being with TalkTalk. Good-Oh. I have just paired it with my T4000, on the same iPad that the YouView app is paired with my T2000. And I have now set a reminder for the 18:30 BBC News, which it told me and shows me is set, but has not propagated anywhere, and a recording at 20:00 of the BBC4 programme about a relative of mine (though I have never been sure about our exact relationship to one another).